R-CAT’s 43 feet offers generous accommodation for up to 6 guests on overnight adventures and up to 14 guests for day excursions. The accommodation comprises three queen sized suites and three private bathrooms. The two forward private cabins have air conditioning and all cabins have fans and excellent natural ventilation. Being a catamaran, she is very stable and offers fantastic space. Her contemporary and spacious interior is furnished with maple and tan leather generating a cool, calm and relaxed atmosphere throughout. With a minimum draft of 3.2 ft this luxury catamaran is a unique opportunity to cruise in areas where other yachts could be restricted by their draft due to shallow waters. She provides charter guests with a friendly professional crew of 2 and a good selection of water toys for outdoor fun. 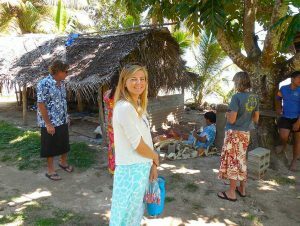 R-CAT is ideal for your luxury Fiji vacation. Another starting point for your charter is Taveuni Island. Scheduled, daily flight service is available from Nadi and Suva into Matei Airport on Taveuni. 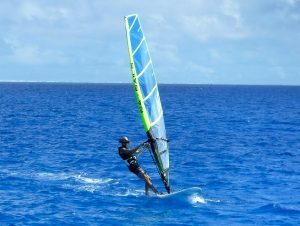 A destination in itself, Taveuni, known as the “Garden Isle”, is an excellent sailing destination and ideal base for land and water exploration. 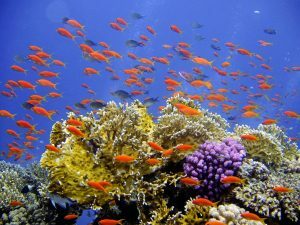 Dive the world famous Rainbow Reef and Great White Wall (noted in the ‘Top 10 Dive Locations in the World’ by U.S. Divers magazine). 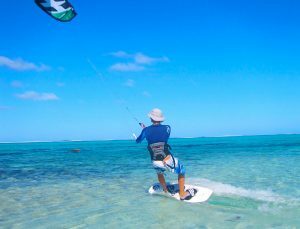 Hike to magnificent waterfalls; Straddle the international dateline; Kiteboard at Matei Point; Enjoy friendly and relaxed Paradise Resort; Taveuni has it all! Known to the locals as “The Hidden Paradise”, Savusavu truly is. You can fly into Savusavu airport where transportation can be arranged for the trip to Buca Bay, where you will meet the yacht. Savusavu has a wonderful vegetable market with handicrafts, great local restaurants, rain forest hikes, resorts, diving, and don’t miss grabbing a drink with the sailors at the Savusavu Yacht Club during sunset! An afternoon sail away from Buca Bay or the Ringgolds. Available in day, overnight or week-long charter itineraries. If you were to describe the most idyllic tropical bay, you would be describing Albert Cove on Rabi Island. 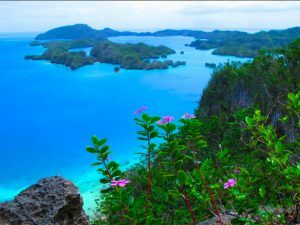 Turquoise water over vibrant corals with a white sand beach, volcanic rock outcroppings poking out of lush jungle with swaying palms and a couple of palm-thatch huts in the middle to complete the tropical picture. Rabi Island is a place that time never reached and the few native islanders live a simple subsistence lifestyle here. 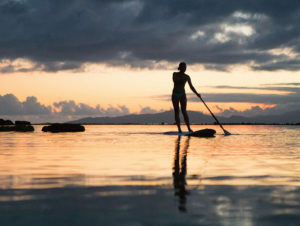 Kayak the bay, head out on the SUP, snorkel the reef, or if you’re lucky, ride that elusive northern reef break. Rabi is a special place where you may want to spend more than one night soaking in the beauty and serenity of this picturesque bay. An afternoon sail away from Savusavu. Available in day, overnight or week-long charter itineraries. If you’ve been dreaming of SCUBA diving every day from your private charter yacht, Namena is the destination of choice. Rated in the top 10 dive sites in the world, Namena is truly a world-class diving destination. We can arrange for you to dive with a certified local divemaster operating out of Namena Island Resort. With over 20 different named dive sites, Namena Island is unquestionably a divers paradise. 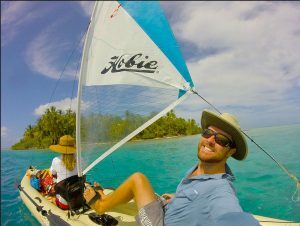 Fly into Vanua Balavu for an exclusive week-long trip or sail from Taveuni (overnight in Qamea before a full day sail to Vanua Balavu). Available in week-long and 10-day charter itineraries. If you’re looking for a once-in-a-lifetime experience then Vanua Balavu is your destination of choice. There are no resorts on the island and one commercial flight per week that lands on a grass airstrip or a charter plane can be arranged. 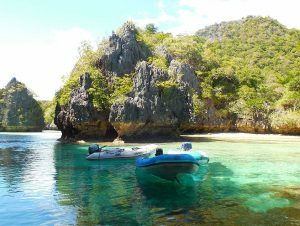 The only people lucky enough to enjoy this unspoiled paradise arrive on private yachts, and there are only a few yachts that venture out this far. Lucky for you, R-CAT is one of them! The Bay of Islands in Vanua Balavu is our favorite place on earth. Words or pictures cannot express the beauty and magic of this special place. You have to experience it for yourself. 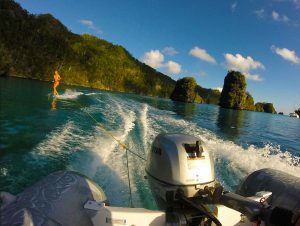 The diving is amazing, the kayak exploration is incredible, the hiking invigorating, the fishing is excellent and you are guaranteed to catch a walu for dinner. You owe it to yourself to experience this beautiful place before it’s discovered by the rest of the world. 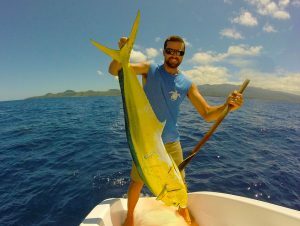 Contact us today to discuss a charter to Vanua Balavu. Please contact us for our very best rates by clicking here and learn more about our packages. Our rate are billed in US dollars and include Fijian taxes. 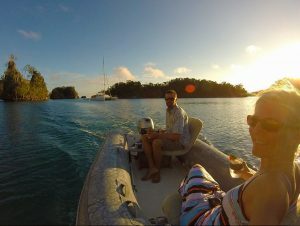 Private use of R-CAT for a day or evening charters, up to 6 guests: $1,308 ($218 per person up to 6 guests). Additional guests: $109 per extra person from 7 of 14. 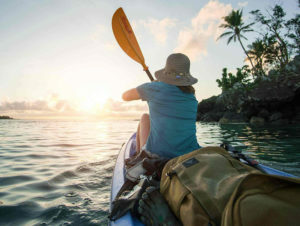 * The inclusive charter rate includes overnight accomodation on the yacht, the customary services of the captain and chef/stewardess, all onboard meals and non-alcoholic beverages, local fees, permits, fuel expenses, onborad WIFI and all ordinary expenses related to rnning the vessel, inclusing the use of sports equipment on board such as kayaks, fishing gear, paddleboard and snorkle gear. Not included in the rate: Airport and hotel transfers, alcoholic beverages, crew gruatuities, shore based or other third-party activities. ** DAY/EVENING SAIL sail rates include snacks/appetizers and non-alcoholic beverages. A full catered lunch or dinner is available for an additional $50 per person. The balance of payment must be received 60 days prior to the arrival date. LATE PAYMENT POLICY: Any late payment will immediately incur a fee equal to 1.5% of the full charter rate. ​If you cancel less than 60 days before your arrival you will be charged 100% of your payment.